2014 marks the 750th anniversary of the Battle of Lewes - an extremely important event in the history of England. Lewes Priory Trust has produced some exciting educational resources about the battle which are free to download here. These were made possible by a grant from the Heritage Lottery Fund. Why was the Battle of Lewes Important? By 1264 disagreement between King Henry III and some of his barons had reached breaking point. The barons, led by Simon de Montfort, wanted restrictions placed on the King’s power as they felt he was using the country’s riches unwisely. De Montfort wanted a council of Barons to have the power to restrict the King’s excesses. 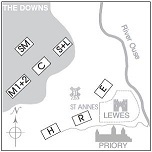 The conflict reached a head on the 14th of May when the two armies met in battle at Lewes. De Montfort’s Barons defeated the King’s larger army and Henry III was forced to sign the Mise of Lewes at Lewes Priory. No copies of this document survive but it is internationally recognised as establishing the principles for the first democratically elected parliament and was the first step to creating a constitutional monarchy in Britain. All of these resources are free to download and you can tailor them to your requirements. The copyright remains with Lewes Priory Trust, Helen Chiasson, Kate Hickmott and Andy Gammon. Although the resources have been created for educational use, they will be enjoyed by people of all ages who have an interest in medieval history and this important event. Using the ‘Helmet’, the Battle of Lewes Memorial in Priory Park, as an inspiration, this workbook allows children to explore the background and events of the Battle. It also includes an introduction to medieval heraldry. Suitable for Year Two children and above. The maps show the progress of the Battle with the positions and progress of the opposing armies. This information is needed for the workbook. A series of five engaging stories complement and inform the workbook. They tell the events of the Battle of Lewes through the eyes of different participants: Henry III’s brother, Richard of Almaine, Baron John FitzJohn, a monk from the Priory of St Pancras at Lewes, Isabella Hardcastle, a cheese seller and resident of the town and a ghost! These stories have also been recorded by professional actors and the audio tracks can be downloaded here. Suitable for Key Stage 1 and upwards. The main events of the conflict are outlined in order to give an overview of what happened. There are two versions available - the 12 scene outline is more suited for KS1 and the 24 scenes outline is more detailed. 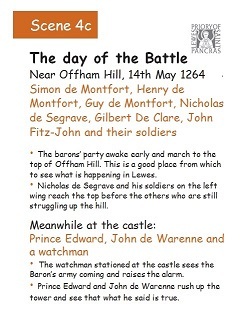 Simple text and clear, beautifully illustrated line drawings tell the story of the Battle of Lewes. This picture book sets the story in Lewes town and the surrounding landscape and gives a real idea of the characters involved, the roles they played and also includes many examples of the heraldry of the time.